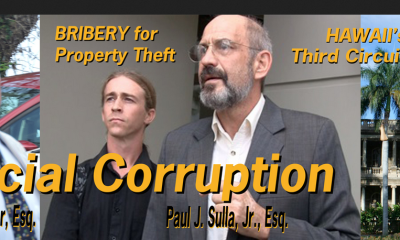 Judge Ronald Ibarra Aides Corrupt Lawyer Paul J. Sulla, Jr.
HONOLULU ATTORNEY GARY DUBIN: AMERICAS LEADING FORECLOSURE EXPERT OR CON MAN? All posts tagged "third circuit court hawaii"
Judicial Corruption News is a service of Healthy World Organization, dedicated to natural healing and the "truth that shall set us free." If you wish to support this service, sign up for our free Healthy World Newsletter, become a Healthy World Affiliate, contribute to our sponsors, 528Records.com, 528RadioNetwork.com, and become a customer of CureShoppe.com to heal naturally and stay healthy.